I love to show you easy and inexpensive ways to create scrapbooks. Have you heard about Brown Paper-bag albums? 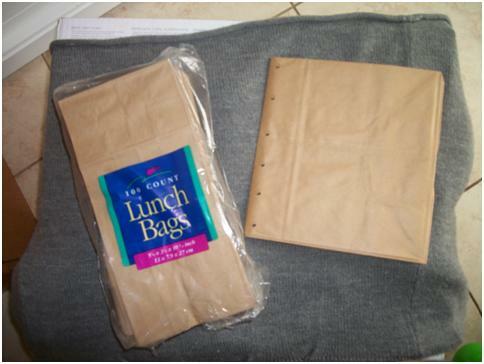 You can buy those Brown-paper lunch-bags anywhere and they are only a buck or two like 50 of them…. I create them all the time, especially as gifts for family and friends to give to. They are simple and very cute and will hold a lot of memorabilia. I created one as a “In memory of” Album for my sister a few years back…. It is still my favorite album check it out and it was soo simple to put together and it holds up really well. I also did a little research for you guys and found a great video on how to create one. I’m not the video type, so I can’t make one for you guys but Follow the Paper trail did a great job in showing you how to make an album… Believe me once you made one, you are hooked, they are soooooo soooo cool. Brown Paper bags, as many as you like if you make a smaller album 4 bags will give you 16 scrapbook pages with 4 pockets and 4 flaps…. so a package of Brown Paper bags will go a long way. Anything you like to decorate the album, stickers, scrapbook paper, ribbon, and of course your pictures…. Layout your paper bags by alternating the flaps. Lay down the first bag with the opening on the left and the flap on the right, then with the second bag on top of the first have the flap on the left and the opening on the right and so on. This will help even out your album so the thicknesses of the flaps are not all on one side. After you have your bags organized then fold them together like a book and bind them somehow. I always punch holes in them and tie ribbons around to hold it together. Another option is to sew the bags down the middle to create a binding for your album, I do that sometimes, too and the books holds a lot better…but takes more time as well. Once you have bound the book then you are ready to start decorating your pages. Cut the scrapbook papers to the appropriate sizes to cover the pages. You will want a base cover for the pages, then cut photo mats and add embellishments. Finish the album by adding your photos and journaling to personalize the pages. That is so neat.. I would’ve never thought to use paper bags to make a scrapbook. I will have to give this a try. This is great I have always wanted to learn that technique and you did great!!! REALLY GOOD you are a pro!! I can not waot to get creatin!! I had a long comment then forgot to fill in the name above so I lost it! I think this is a neat, inexpensive idea. My children want to try doing them now and then, this would work:) I’m glad I decided to find something to read for an entry as it sure helped me! What a great idea! I should do this with my daughters–they would really love them, too. Guess my husband will need to bring his lunches in plastic bags from now on, lol. Thank you sooooo much!!! This tutorial is awesome, I have been wanting to make one of these, just had not took the time look it up. You’re so smart. I never heard of a Brown Bag Album. I think this is a super idea though. I have a lot of brown bags and I would like to make use of them. This is terrific to try.